There is an old adage used around the 12 Step rooms of recovery that goes something like this: “A grateful alcoholic will never drink” or, if you prefer, “A grateful addict will never use.” Although not scientifically proven, many in long-term recovery swear by such a statement. The understanding is that, by demonstrating continuous gratitude for being substance free, for a life of recovery, and for all those things that a life of recovery offers you, a person in recovery will stay in recovery by keeping an attitude of gratitude and a mindset of thankfulness in their everyday lives. As Thanksgiving descends upon us each year, it is natural to take some extra time to find things that we are grateful for and the things that we can be thankful for both for those individuals in recovery and for everyone else in general. For those in recovery, as mentioned above, gratitude and thankfulness are taught to be daily mindsets and principles to live by, since the nature of addiction is that the suffering individual can easily lose sight of such things, can easily victimize themselves, feel sorry for themselves, get resentful that life isn’t working out as they would like or just live every day with a general feeling of hopelessness. Therefore, because it is Thanksgiving, we felt it necessary to take some time to reiterate things that we as an organization are grateful and thankful for during this time of year. Here at MARC, we are thankful for…our incredible and dedicated staff! Here at MARC, we are thankful for…the trust that families and friends have in us for taking care of their loved ones suffering from addiction and co-occurring disorders. Here at MARC, we are thankful for…the trusted partners we have in the field of addiction and mental health treatment, that value patient safety and care, collaboration, communication and making sure that everything we do is putting the patient and family first. Here at MARC, we are thankful for…the many great people in science, medicine, research, politics and community organizations that are spending tireless and dedicated days and nights searching for and finding solutions to the ongoing addiction epidemic in America. Here are MARC, we are thankful for…the opportunity to be of service, to our patients, their families, and the community and that they allow and invite us into their lives. 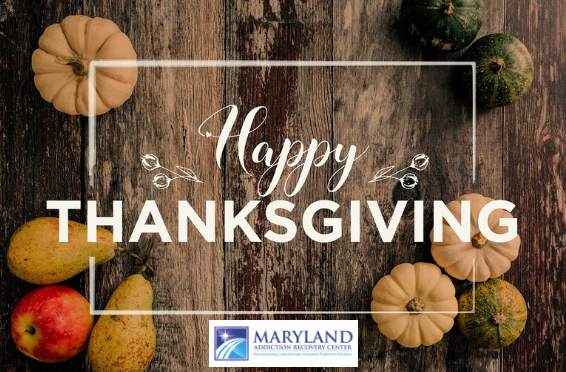 Here at MARC, we are thankful for…the potential to be a solution to so many individuals suffering from addiction and mental health, both here in Maryland and nationwide. To offer treatment, support, and hope to so many who feel isolated, alone and hopeless and to offer hope and healing to individuals, families and the community. Thanksgiving is a time for family, friends and the community to come together and share gratitude. However, for so many individuals and families dealing with addiction, the holidays are a painful, lonely and agonizing time and often gratitude is hard to come by. We want to offer this prayer and blessing to all those dealing with the scourge of substance use disorder during this time: That they don’t stay silent and in pain, but rather reach out for help and know that there are loving, caring, dedicated people (both professionals and family and friends) that are willing to be of service and will be happy to help without reservation or judgment. That they know recovery is possible, recovery is worth it, and that recovery is available to all that seek it. We are absolutely grateful and thankful that these are the facts not only of our experience, but millions of people’s experience and we pray that those still suffering find peace, happiness, help and healing during this Thanksgiving season.